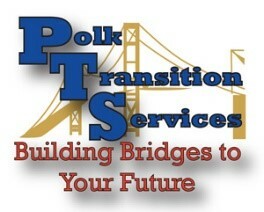 Polk Transition Services will focus on Postsecondary Education, Parental support, and Transition skills. We have transition programs at several of our high schools, and partnerships throughout Polk County. These programs provide an opportunity for students 18 – 21 years of age to work toward their desired postsecondary goals. We address the students wherever their current needs are to transition into adulthood through continued education, work experience, and leisure activities. Being at the location of George Jenkins allows students to transition into the world of work but being exposed to Sweet Delights Café’ (our campus café’ to serve coffee and breakfast on campus to the staff – Students learn to cook, clean, set-up, money skills, soft skills, hard skills, worksite locations, break down the café’, laundry, Fill out applications and learn the world of work vocabulary. As students find out their interests – we try to place them somewhere on campus to help develop those skills during their last year in the unit and even before if it is the right fit. We also go to work at Eaglebrooke and hopefully other locations in the community. CBI trip are on our schedule as well and internships on campus with the students that have demonstrated readiness. Contact Donna Canning if you have any questions.